When you’ve made great bit bold moves towards what you want – what next? When you’ve consistently taken step after step after step towards the edge of your comfort zone – what next? Maybe you’ve changed your diet, habits, made bold moves and stretched your comfort zone in ways you never thought possible. Maybe you asked for the raise, the business or the date. Taking your courage and stepping out – without the certainty of whether you’ll succeed or not. You can’t help but grow – comfort zones, confidence and balls. You’re feeling proud of yourself and pleased with the progress you’ve made. But a bit scared too. 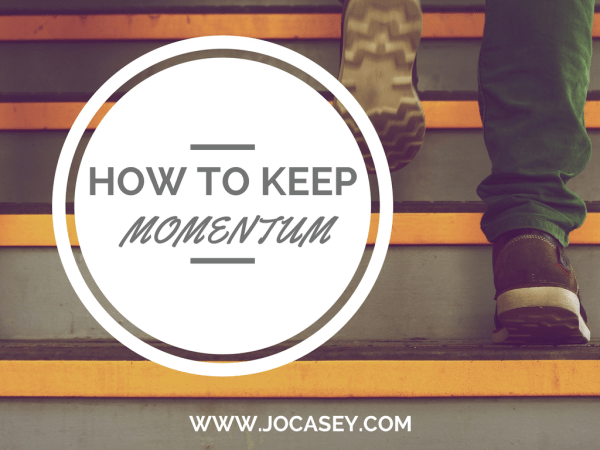 How do you maintain this momentum? How do you keep going, keep growing, maintain the pace? The answer is: You probably won’t. Or at least it won’t appear that way. Attention. Energy. Drive. They ebb + they flow. You likely won’t maintain the same bold, breakneck pace you have been. Maybe you’ll need to rest a while. Maybe take your foot off the pedal a bit. Perhaps it’s time to move onto something else. Perhaps a new passion, direction, or another leg of your journey beckons. This thing isn’t a competition. You can build on the success you’ve had so far. Take time to pause, build in recognition for yourself and how far you’ve come. Celebrate it. Appreciate it. Revel in it. Don’t skip this step! It’s tempting to keep looking forward, your brain saying ‘what’s next?…what’s next?’But it’s essential you reflect back and notice just have far you’ve come. Keep going in the same direction? Make a detour or just sit with the evolution for a while? One step, one move, one decision at a time. You can slow down, you can pause. Just don’t stop. Imagine where you can go next – imagine what 365 days of consistent moving forwards will take you.